Easily discover books and ebooks available at your local library! 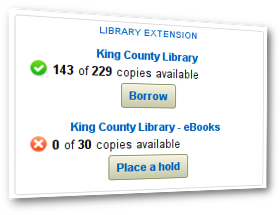 As you browse books and e-books, the Library Extension can check your library's online catalog and display the availability of that item on the same page. Just added to the Mozilla Add-ons Store! Access to more than one library? No more searching across multiple library catalogs. All conveniently displayed on the sites you visit already! You'll get a quick, convenient link to reserve the title from your library! See results from any of nearly 5000 supported libraries and library systems. Don't see your library? No problem! Just let us know! Just install, pick one or more libraries, and start to browse on sites like Amazon.com and Goodreads.com in seconds! Tell Me When is Ready! Yes, please notify me when the Library Extension is ready for ! We won't share your email address or send you any marketing messages - we will only use your address to let you know when a version of the Library Extension is ready!